Situated on approximately 180 acres in one of Pennsylvania’s fastest growing communities, Cranberry Business Park is a mixed-use business campus containing more than 13 buildings and 750,000 square feet for office and flex/industrial use. Cranberry Township has consistently appeared in Fortune Magazine's Top 10 Places to Live List. The area’s close proximity to Pittsburgh and attractive housing has been one of the key contributors to the growth of the community. At Cranberry Business Park, every tenant has their own entrance and the design is deliberately flexible for tenants to carve out space for their own immediate needs. Ready to find out more? Close vicinity to the city of Pittsburgh and easy access to Pittsburgh International Airport coupled with top notch schools and safe neighborhoods makes Cranberry a perfect community to work and raise a family. The park’s large properties range from office/flex to industrial and are intentionally flexibly designed to accommodate the unique needs of the individual businesses. Attractive, affordable housing has been one of the key elements in making Cranberry Township one of the region's fastest growing communities, and the statistics tell the story with a 59.5% growth rate over the past ten years. Cranberry Business Park is always looking ahead on how we can improve the business park. 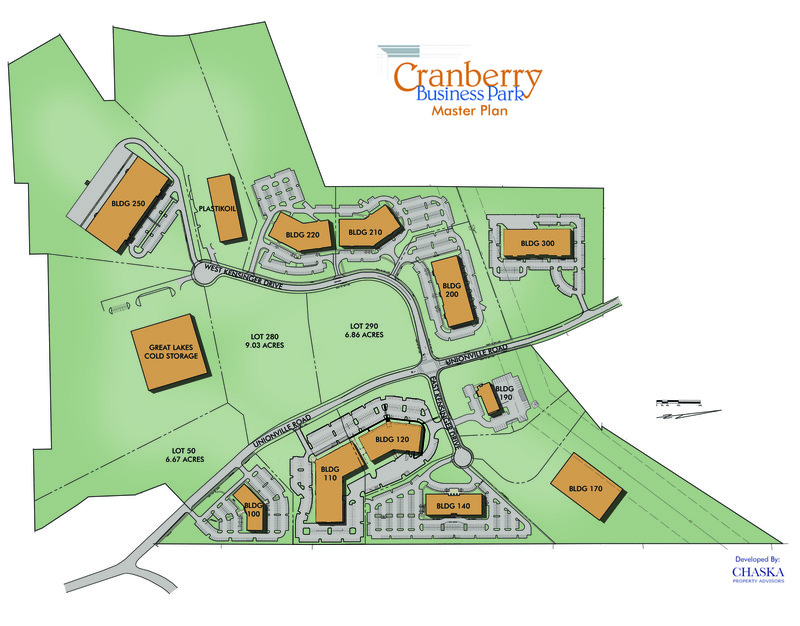 Cranberry Business Park is a mixed-use business campus situated on approximately 180 acres in Cranberry Township, Butler County, Pennsylvania. The park currently contains 13 buildings with in excess of 750,000 square feet. When completed, the park is expected to have approximately 1,000,000 square feet of developed building space. Cranberry Business Park is approximately 20 miles northwest of downtown Pittsburgh, and about the same distance from Greater Pittsburgh Airport. The park abuts the Pennsylvania Turnpike and is approximately 1.5 miles from Exit 3 and I-79 interchanges.